Raffles Hotels & Resorts have partnered with Sipsmith, passionate pioneers of London's artisanal gin renaissance, to create a new bespoke spirit, Raffles 1915 Gin. The custom gin was created to celebrate the 100th anniversary of the Singapore Sling and to inspire the next generation of elite mixologists. It evokes the essence of Raffles and the craftsmanship of Sipsmith. "We were looking for a partner who embodied the beliefs and standards that we hold true to our brand. Sipsmith has an integral authenticity; they are master craftsman at what they do in a business that is steeped in tradition," said Peter French, president, Raffles Hotels & Resorts. "We are delighted to create such an evocative gin that simultaneously celebrates the past whilst inspiring future generations to explore and create." The collaboration is rooted in both history and serendipity with Sipsmith's co-founder Sam Galsworthy being the great, great, great nephew of Sir Stamford Raffles, founder of Singapore and for whom the Raffles flagship was named after. "Raffles 1915 Gin is a stunningly smooth and inspiring spiced gin that evokes that moment when someone would have sipped their first Singapore Sling in the Long Bar in 1915," said Sam Galsworthy, co-founder, Sipsmith. "It is something which undoubtedly would make Ngiam Tong Boon, creator of the Singapore Sling, and my great, great, great uncle, Sir Stamford Raffles, very proud." 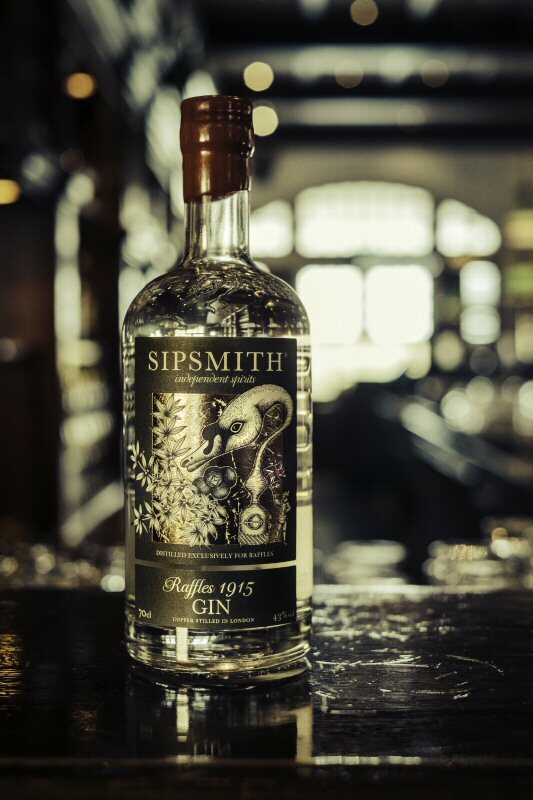 Raffles 1915 Gin was created by Sipsmith Master Distiller Jared Brown and handcrafted at the Sipsmith Distillery in London exclusively for Raffles Hotels & Resorts. It is a sensational balance of botanicals inspired by the Malayan peninsula - jasmine flowers, fresh pomelo peel, lemongrass, Kaffir lime leaf, nutmeg and cardamom - distilled alongside some of the classic gin botanicals found in the award-winning Sipsmith London Dry Gin, including juniper, coriander and orris root. The resulting taste is a smooth and full-bodied spirit, with the warmth of sweet orange spice coupled with an elegant, bright, balanced finish. "We are immensely proud of our collaboration with Raffles to mark this historical milestone," continued Galsworthy. "As distillers, our inspiration lies in the majesty of what has taken place in the past, and how we might translate that for spirit sippers today who want to discover, appreciate and linger." Raffles 1915 Gin will be available at Raffles Hotels & Resorts' bars and lounges around the world. For cocktail enthusiasts in London, 300 limited-edition bottles (70cl) will be available to purchase exclusively at Selfridges from mid-October, whilst stocks last (RRP £44). Visitors can also stop by Harry Gordon's bar at Selfridges for a cocktail specially created to showcase the gin's flavours. Raffles Hotels & Resorts is a luxury hotel brand with an illustrious history dating back to 1887 when the world-renowned Raffles opened its doors in Singapore. Today, the remarkable collection includes twelve extraordinary properties in locations as diverse as Paris, Istanbul, and the Seychelles, with many more in development in exciting destinations such as Warsaw and Jeddah. Whether it's a secluded resort or a lively city-center, each Raffles promises an oasis of calm and charm and a compelling mix of cultures and styles, and has its very own story to tell. Part of FRHI Hotels & Resorts, a leading global company that also operates the Fairmont and Swissôtel brands, Raffles is proud to draw on the timeless essence of Raffles - to deliver thoughtful, personal and discreet service to well-travelled guests. For more information or reservations, please visit raffles.com. Sipsmith is the first copper distillery to launch in London for nearly two hundred years and has re-introduced the art of handcrafted, small-batch spirit production to the capital. Sipsmith has now won over 30 international awards with its London Dry gin, and alongside that crafts Sloe Gin, Summer Cup, V.J.O.P gins in addition to both Sipping and Damson Vodka. Having recently reached capacity in their original site - wholeheartedly committed to the One Shot Method and crafting gin the way it used to be made, and should be made - Sipsmith has moved to a new site in West London. This has allowed them to make room for a new sister still, Constance, to sit alongside their original still Prudence and her sister Patience. Made by Christian Carl, a family run company and the oldest producer of handcrafted copper stills, Constance is a 1500L. For more information please visit www.sipsmith.com. To view the photo associated with this press release, please visit the following link: www.marketwire.com/library/20151013-raffles1915gin800.jpg. Raffles 1915 Gin was created to celebrate the 100th anniversary of the Singapore Sling and to inspire the next generation of elite mixologists.